While Public View Monitors have been a fundamental surveillance tool for many years, they have been analog-only, and therefore fit awkawardly into IP surveillance systems. Now IP versions are coming to market. In this note, we examine IP based PVMs and compare them to traditional offerings. 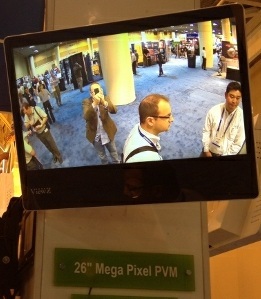 Most PVMs are placed at building entrances to display an image captured from an onboard camera. This shows everyone passing by the monitor that video surveillance is deployed and in-use throughout the facility. Not only does this signal a 'safe' environment to honest occupants, it warns troublemakers that they are under observation. For background review our "Public View Monitors" report. 1. Megapixel Resolution Enhances Utility: Given the greater resolution and wider FoV afforded by megapixel cameras, IP PVMs have the advantage of 'seeing more' than their analog counterparts. Not only can they see more of a given scene, but the increase pixel density could record details not resolute with non-MP models. 3. Straightforward integration into VMS platforms: Perhaps the greatest strength of IP PVMs is the ability to directly connect the camera into the recorder. Given that many PVMs only display the output of the integrated camera, the addition of an IP camera eliminates the need for a secondary encoder. For PVMs used to display the output views from several cameras or a VMS client, the IP connection can mean the elimination of several expensive pieces of equipment like additional workstations or decoder units. 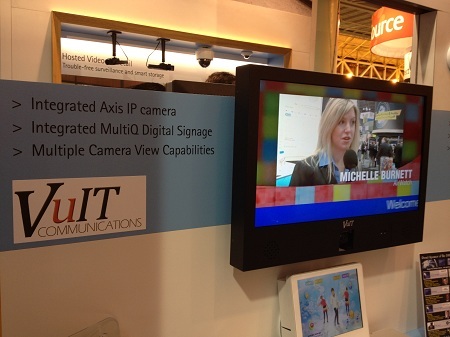 The VuIT PVM was being demonstrated in the Axis booth at NRF-LP 2012. The product is in the early stages of distribution and is not currently yet available. Final pricing is subject to pending agreements and is not public. VMS integration equivalent to M3114/ONVIF. Limited Selection: Because IP PVMs are new products, the selection of screen sizes and camera specifications are not as broad as analog version. At the current time, only a small number of manufacturers are producing IP PVMs, and some are still in the pre-distribution/resell phase. However, early pricing ranges from $2500 and upward. More Expensive: IP PVMs are more expensive that their analog counterparts. In many cases, justifying the additional cost may prove difficult, especially given the simple, straightforward role that most PVMs provide: local display of a single, attached camera. Especially during the 'early adoption' period, costs of the IP units will sell between $800 - $1500 more than the closest analog equivalent. However, if the additional features of the IP PVM enhance utility of the units, then the addition cost may be justified compared to piecing together a custom solution.